Western blot analysis of cell lysates from HeLa, NIH/3T3, C6 and COS cells using SET7/SET9 Antibody. 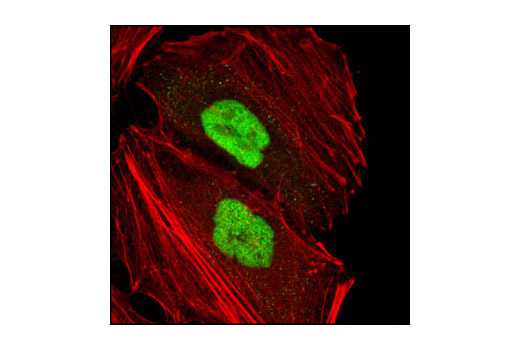 Confocal immunofluorescent analysis of HeLa cells using SET7/SET9 Antibody (green). Actin filaments have been labeled with Alexa Fluor® 555 phalloidin (red). 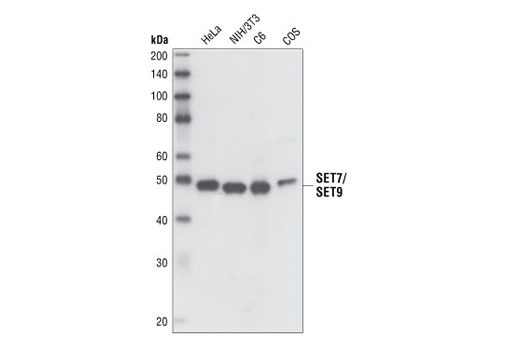 SET7/SET9 Antibody detects endogenous levels of total SET7/SET9 protein. This antibody does not cross-react with other SET domain-containing proteins. Polyclonal antibodies are produced by immunizing animals with a synthetic peptide corresponding to the human SET7/SET9 protein. Antibodies are purified by protein A and peptide affinity chromatography. SET7/SET9 is a member of the SET domain-containing family, and can specifically methylate Lys4 on histone H3 (1). Like most other lysine-directed histone methyltransferases, it contains a conserved catalytic SET domain originally identified in the Drosophila Su(var)3-9, Enhancer of zeste and Trithorax proteins. Histone methylation is a major determinant for the formation of active and inactive regions of the genome and is crucial for the proper programming of the genome during development (2,3). Methylation of histone H3 Lys4 enhances transcriptional activation by coordinating the recruitment of BPTF, a component of the NURF chromatin remodeling complex, and WDR5, a component of multiple histone methyltransferase complexes (4,5). In addition, methylation of lysine 4 blocks transcriptional repression by inhibiting the binding of the NURD histone deacetylation complex to the amino-terminal tail of histone H3 and interfering with SUV39H1-mediated methylation of histone H3 Lys9 (1). SET7/SET9 is highly active on free histone H3, but only very weakly methylates H3 within nucleosomes (1). Besides histones, SET7/SET9 also methylates Lys189 of the TAF10, a member of the TFIID transcription factor complex, and Lys372 of the p53 tumor suppressor protein (6,7). Methylation of TAF10 stimulates transcription in a promoter-specific manner by increasing the affinity of TAF10 for RNA polymerase II, which may potentiate pre-initiation complex formation (6). Methylation of p53 at Lys372 increases protein stability and leads to upregulation of target genes such as p21. Thus the loss of SET7/SET9 may represent another mechanism for the inactivation of p53 in human cancers (7). Nishioka, K. et al. (2002) Genes Dev. 16, 479-489. Kouskouti, A. et al. (2004) Mol. Cell 14, 175-182. Chuikov, S. et al. (2004) Nature 432, 353-360.